Special Containment Procedures: SCP-268 is currently to be maintained within [DATA EXPUNGED], as it has been deemed that the change of use for facilitation of escape by restricted personnel or humanoid SCP is too great. However, the possibility of use by field agents after further testing is under review. See addendum 268-05. 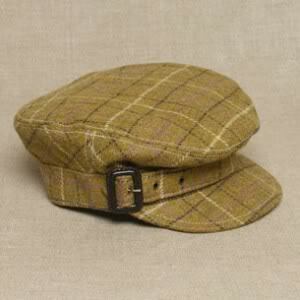 Description: SCP-268 is a tweed-wool newsboy cap. The design and make seem to be of Irish origin. Due to the style and fabric, it is estimated to have been created in the late 1800's to early 1900's, though fiber analysis is inconclusive. The only markings on the cap are a small label with writing in Middle Irish, reading "The Garden is the Serpent's Place." However, there are various indications that this label was sewn onto the cap in recent times. Due to the nature of the artifact, testing has been extremely difficult. SCP-268 seems to be a normal hat until it is worn. Anyone wearing the hat, however, becomes suddenly and instantly unnoticeable. Subjects become unmemorable, thoroughly ignorable, or "taken for granted" by all observers. Observers, with specific prompting, are able to later recall physically seeing the subject, but can give no specific details other than "seeing a man with a hat". Observers seem to have the overwhelming feeling that the wearer is someone that was "supposed to be there", and thus did not merit thought or notice. During initial testing, remote analysts completely forgot what they were supposed to be observing within the chamber, and it was not until the D-Class subject wearing SCP-268 spoke out loud that he was noticed again. Removal of the artifact, vocalization, and physical interaction with observers seem to be the only way in which wearers of SCP-268 can make themselves noticeable. Once an observer has been made to 'notice' a SCP-268-wearing individual, they slowly begin to ignore the subject once more unless kept actively engaged by the wearer. Testing reveals that if a subject wears SCP-268 upwards of twenty (20) cumulative hours, its effects seem to linger, with diminished potency, on the subject even while not wearing the artifact. Testing in this area has been cautious due to the possibility of containment breaches, but one incident [see Addendum 268-04] has shown that if the artifact is worn long enough, that the effect is rendered permanent and unbreakable. Extensive research is still unable to determine whether or not electronics are directly affected by SCP-268. Observers viewing an SCP-268-wearing subject through electronic means still have difficulty acknowledging the subject's existence, and even when noticed, observers report to be unable to see the face of the individual in question. Observers note pictures of SCP-268-wearing individuals as being "blurry", and digital media such as surveillance cameras is reported to become "grainy and unfocused". Research is unsure whether these alterations are extant and physical, or merely perceived due to SCP-268's properties. It should be noted that although capturing SCP-268 through visual electronic means has been difficult, motion-sensing, weight sensing, heat seeking and similar devices all trigger correctly when encountering an SCP-268-wearing subject. Addendum 268-01: SCP-268 is noted to have some similarities to SCP-180. SCP-268, however, does not seem to function on inanimate objects, and more importantly does not directly steal the identity of its host. While SCP-180 causes its host to become unrecognizable after SCP-180 itself is removed and placed on another object, this seems to be a side-effect of its function of identity theft and transfer. Meanwhile, SCP-268 could be said to 'steal' the identity of long-time wearers as they become irrevocably forgotten. This has caused some speculation as to whether the items share similar origins, or whether the many similarities they share are merely coincidental. Addendum 268-02: At Agent ███████'s request, and after approval by Dr. █████████ and Dr. Klein, SCP-268 is being used with agents in active field duty. Results thus far have been favorable. Addendum 268-03: Field-Testing has been suspended. Though Agent ███████ appears to have been on payroll and on records, no personnel, either on Site-██ or in higher command, remember knowing or hearing about an Agent ███████. Further tests should be conducted only on D-Class personnel, and on no single individual for longer than ten (10) hours.